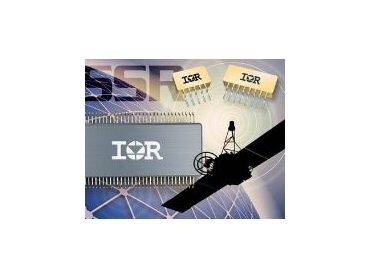 INTERNATIONAL Rectifier (IR) has released a quartet of devices in a new line of RAD-Hard solid state relays (SSRs) for high reliability (hi-rel) applications. The new hermetically sealed SSRs are radiation-hardened, all-electronic devices designed to improve reliability by replacing electro-mechanical relays in power bus switching, heater control circuits, battery charging and other hi-rel applications. The first SSR is the RDHA710SE10A2Q (SMD mount) dual SSR, with current handling capabilities of 20A (10A when properly de-rated) and a breakdown voltage capability of 100V, which is high enough to allow normally applied de-rating. The second and third devices are the RDHA701FP10A8Q and the RDHA701FP10A8C, containing eight SPST, NO, 1.5A, 100V SSRs with selectable input actuation methods and a choice of rise/fall time control. They are housed in a 64-pin surface mount package. The fourth SSR is the RDHA720SF06A1N, a single 20A, 60V device, also in an SMD package. Most of these devices are available in alternative style packages for flange mounting. The new devices are characterised for total dose levels of up to 100k rad (Si) or higher and single event effects (SEE) immunity up to an linear energy transfer (LET) of 37 MeV/(mg.cm2) or higher. Isolation is 1000V I/O. Class "P" (Unscreened), "H" and "K" screening is available. The new SSRs are available in single, dual or octal SPST NO (single pole, single throw, normally open [Form A]) type with current ratings of 1.5A to 20A at 60V to 100V. In addition, some of the new relays have internal circuitry to control output transition times for lower dV/dt and dI/dt, minimising system RFI/EMI, an important feature in today's compact systems.